The rivalry existing between China and India is based on a long historical trajectory dating back to the epoch of the silk route. Understanding the context of India’s dominant position in South Asia is important to ascertain the current changing dynamics and the emerging role of Japan, which can be viewed through the lens of the stag hunt in economics game theory, writes Eshan Jayawardena. The rivalry existing between China and India is based on a long historical trajectory dating back to the epoch of the silk route. More recent conflict emerged at a time when both states strived to emerge as nation states after facing colonial encounters for centuries. Nevertheless, the present-day antagonism between the countries mainly arose as a result of the border dispute and later converted into the respective quest of each to be a super power. In the recent past both China and India have emerged as new powers in terms of economy, political stability and military strategy. This newly developed status of both countries has simultaneously fed a mutual suspicion of each other, which is why India keeps a watchful eye on the Chinese influence in South Asia and China shows the same attitude when Indians expand their operation in Central Asia, which geographically is sandwiched between India and China. Understanding India’s paramount position in the South Asian region since the day it became a nation state is important to ascertain the current changing dynamics. It is true that since 1947 India has kept a tight grip over its smaller neighbours in various circumstances. After gaining its independence, Indian policy makers strived to recast India as a strong nation state and influencing the internal affairs of other neighbouring states in South Asia became the common factor in Indian post independent foreign policy. Having realised India’s superior position in the region, many of its neighbours have become cautious in their policy planning, upholding healthy relations with both Beijing and New Delhi. However, Indian’s indispensable position in South Asia cannot be solely attributed to Indian military power or its effective diplomacy. It is rather the outcome of the Indian strategy of keeping other super powers out of South Asia by maintaining their own bilateral relations with them. In many modern political moments of South Asia , the US, UK, Soviet Union or China had not meddled with South Asian states in order to avoid any confrontation with India. Even in the few exceptions in the recent past, major super powers were reluctant to make any moves that would upset Delhi. More or less, small South Asian states envisage the Indian dominance as a fait accompli since no other power has been willing to act as a balancer. Why did Sri Lanka and other South Asian states fail to provide balance against India? In examining this, one has to understand the indispensable position of India as the omnipotent political power in South Asia which has decisively staved off major powers from getting involved in regional politics. The biggest example of this is how Regan’s administration avoided intervening in the Sri Lankan civil ethnic conflict in the 80’s, instead deferring to India even though the then Prime Minister J.R Jayawardene, nicknamed Yanki Dicki for his pro American policy, considered the US a closer ally. His initial expectation was that the US would play a bigger role in mediating the tension between Tamil separatists and Sri Lankan government. But to his biggest surprise the US state department clearly mentioned Sri Lanka should allow the Indian government into these negotiations. Having gone through much turmoil and diplomatic hurdles it is a fact beyond dispute that India holds the helm over in its neighbour states in South Asia. Nevertheless, this tendency reached its ebb in the last decade with the rapid growth of the Chinese economy and the decline of Indo-Sino relations. As a matter of fact, the political and military relations between the two states have been in tatters for the past ten years although their economic interests have grown considerably. With affirmed political, military and economic stability, Beijing does not bother appeasing Indian before it enters into South Asia, even though it may cause agitation in New Delhi. With this in mind, India must either accept the end of its reign over South Asian politics or it should step up its game in a different way with Beijing. India has presented a fascinating prism of the famous stag hunt method (as witnessed in Economics Game Theory) in which players must co-operate in order to hunt larger game, or in this case, to counterbalance China in the region. In the mind of people in Sri Lanka, the image of India always has been hostile with its dominating involvement in Sri Lankan politics; many of Sri Lankans still despise New Delhi for its intervention over Sri Lankan ethnic conflict in 1987. However, China has been more astute and extended its clear support to Sri Lanka even during the hard times Sri Lanka underwent, for an example the country’s only international conference and international theatre were built under Chinese funds. This rapidly increased during the last stages of the war where China unconditionally supported Sri Lankan financially, militarily, and in the International arena. Tamil Nadu’s pressure upon the Indian central government prevented them from aligning with Sri Lanka which created a public opinion on the island that India frequently hinders Sri Lanka’s stability. Furthermore, even after the war ended China has extended its relationship with Sri Lanka, helping to develop its infrastructure. The development projects embarked on by the Sri Lankan government in the post-conflict era were initially handed to India under the impression that India would heavily meddle with the nation building process in the island, but China took the plunge when such requests were denied by the Indian government, going on to develop its OBORas well as the ‘String of pearls’ strategy invested heavily in Sri Lanka. 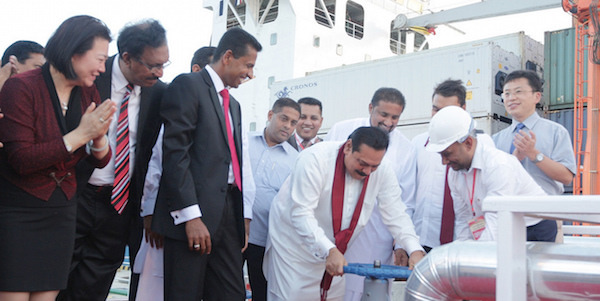 Former Sri Lanka PM Mahinda Rajapaksa inaugurating the fuel bunker terminal, Hambantota port. Photo credit: President’s media, Flickr, CC BY-NC 2.0. The growing Chinese influence and presence in Sri Lanka during the regime of former president Mahinda Rajapaksa made New Delhi uneasy and the incident of arrival of Chinese submarine in 2014 was one of factors that that compelled New Delhi to pay its extreme concern over the Chinese presence in Sri Lanka. On the other hand when current SL president Maitripala Sirisena appeared as the common candidate in 2014 presidential election against Rajapaksa, his manifesto clearly illustrated that his future government would stop Chinese projects in Sri Lanka like Colombo Port city. Following the unexpected defeat of Mahinda Rakapaksa and the present Prime minister’s open criticism of Chinese investments in Sri Lanka, including a statement that the massive port city project will be cancelled when they come into power, the government has since re-approved the project, paying a fine to the Chinese for its initial cancellation and subsequent delay. India has realised it cannot stop the growing Chinese influence in Sri Lanka or in the Indian Ocean. Hence it has cultivated an alliance with Japan and USA to counter the Chinese influence in South Asia. Even though the US has been a failure when it comes to investments in the subcontinent, it is apparent that the Japanese are going out of the way to counter the Chinese influence with the Japanese foreign minister who visited Sri Lanka extending unconditional support to Sri Lanka in terms of financial aid etc . The Colombo South LG gas project India desired was initially not awarded on the grounds that the government was reluctant to award it to India alone. However in this instance, the economics stag hunt becomes apparent, as India managed to draw a partnership with Japan to work on this project. Similarly, India has partnered with Japan to develop the oil tanks in Trinco and the other ports in Sri Lanka as a measure to counter the growing Chinese influence. The above mentioned foreign involvements in the Sri Lankan development project clearly show the continued role of the Indian influence and how it has come to also rely on other powers such as Japan in its attempt to balance the Chinese presence in Sri Lanka. As the monopoly of the world economy is shifting towards Asia and Sri Lankan territory is been used in the geopolitics of the region due to its strategic location, leaders of Sri Lanka should be smart enough to play a moderate, but essentially diplomatic role in obtaining the better benefits for the country’s development. Eshan Jayawardena is a guest lecturer at the Open University of Sri Lanka. He studied Sociology at Delhi University and holds a Masters in International Relations from Jawaharlal Nehru University in New Delhi. He can be reached at [email protected].